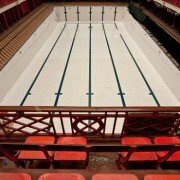 Fran Higson’s film United We Will Swim… Again about the 14 year long struggle to save Govanhill Baths has started a tour of the UK, screening at swimming pools, community centres and other events across the country. 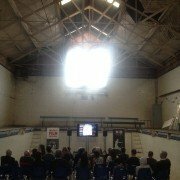 Fresh from the premiere at the Edinburgh International Film Festival, the tour kicked off on Saturday at Templemore Baths in East Belfast. 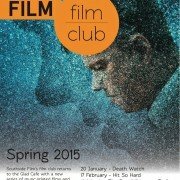 This weekend there will be two separate screenings in Manchester, at Withington baths and Victoria Baths and one in Leeds. From there the tour goes to Oxford, London (twice), Brighton and ends in the West Country at the Tolpuddle Martyrs Film Festival. 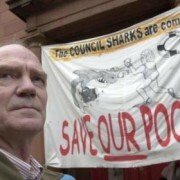 In 2001, when Glasgow City Council decided to close the baths in Calder Street, a very varied group of people came together to fight the closure. Andrew Johnson had seen 4 of his children learn to swim here as part of the highly regarded Kingston club, and was one of the earliest to start organising against the closure. Over the next 14 years Andrew, more than anyone, guided and led what became one of the most effective and historic political campaigns in Glasgow’s history. The campaign against the closure became a campaign to re-open and a campaign against demolition. In 2004, in response to the council’s decision to seek a buyer, The Govanhill Baths Community Trust was formed. Andrew became Chair of the Trust and, in that role, forged an organisation that has exceeded expectations and now stands on the brink of refurbishing the building in to a “Well Being Centre”. It is this vision of a centre that goes beyond swimming, a community asset that addresses the physical mental and social health of the community the people most associate with Andrew. It is virtually impossible to find words to fully describe his contribution, such was the impact of his leadership and guidance over the years. The gap left by his departure will be hard to fill. Govanhill Baths Community Trust wishes to thank Andrew for all he has done for this community. When the pools reopen and Govanhillians swim again, it will be a legacy that many people share but he can be more proud of than most. It is hard to imagine how we could have continued the campaign over a decade and a half and reached the stage we are at right now without him. He is, and always will be, a legend in the history of Govanhill Baths. 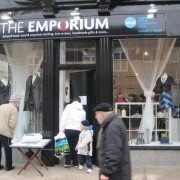 It was with deep regret that GBCT had to make the decision to close our Charity Shop, The Emporium. The shop opened in August 2001, initially at a site in Calder Street and then to the popular site on Victoria Road. Rising costs and the recession have hit many similar shops and we could not justify the costs eventually when rents and other costs continued to rise. As well as raising much needed funds for the campaign to save the Baths, it served as a social place, where people visited and volunteers formed friendships and learned new skills. The volunteers were a great team who were great advocates for the Trust and, to many local people, the public face of the campaign. But the success and impact of the Emporium was largely down the work and dedication of one particular person, our shop manager Inga Zaiceva. She was respected greatly by her volunteer staff and also by the wider community. Her multi-lingual abilities meant that she was often the “go to” person for many of Govanhill’s Eastern European community. She was always there for advice and help. Inga’s vibrant personality brought a new layer of supporters and volunteers to the Baths. In her time with us, her professionalism and skills played a huge part in taking the Trust to where we are now, ready to start the next phase of refurbishing the building and swimming pools. She deserves our heartfelt thanks for her contribution over 8 years and will always be respected and remembered as an integral part of the history of Govanhill Baths. We wish her all the best and success in the future. 100 years since the laying of the foundation stone of the building, Govanhill Baths Community Trust is delighted to announce the formal launch of a permanent archive and centenary publication. United We Will Swim: 100 Years of Govanhill Baths, published by Luath Press, documents the rich, diverse and inspiring story of Govanhill Baths and the community that it serves. It includes seven newly commissioned essays, with a foreword by Lesley Riddoch and an introduction by Andrew Johnson, Chair of Govanhill Baths Community Trust. These explore its significance as a historic building, creative hub, a community resource in terms of health and diversity and the grassroots campaign to save it. 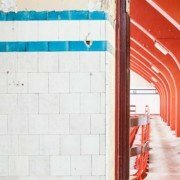 Throughout the book there personal memories from users of the Baths that have been captured as oral histories, alongside a wealth of images of the building, the people that have used it and objects from the archive. The archive has been developed by Paula Larkin and a group of volunteers and houses a broad collection of materials related to the physical building, it’s users, the campaign to save it, and it’s current use as a community hub. It also documents the building through each phase of development on its journey to fully reopening as a Wellbeing Centre. The archive is a unique community resource for current and future generations to use. To showcase objects from this archive we are also launching a permanent display area designed by NORD Architecture, which will show a range of material in the collection including newspaper clippings, photos, objects, documents. A temporary exhibition will complement this presenting press reports from the last 100 years. We formally opened the exhibition and launched the publication on the 19th March. The exhibition also features Future Archive, new work by artist in residence, Ailie Rutherford. Ailie has been working with local groups and individuals on the creation of artworks; these include screen printed notes for the People’s Bank of Govanhill and Talking Soap. We plan to give new life to the underused garden at the back of Govanhill Baths Community Trust on Kingarth Street and develop a community garden space; a place of rest and reflexion. The project will create a ‘Wildlife Garden’ with wildflowers and innovative upcycled planters installation with a discreet tree seating. We aim to work with local residents in partnership with South Seeds, Urban Roots to redesign the area to allow wildlife to flourish. Our second ‘How to…’ guide booklet will be produced and an illustrator will sketch each sessions to provide drawings and step by step instructions. The Board of the Trust is delighted to announce that the Big Lottery Fund has awarded us a major development grant of £34k to take forward Phase 1 of our scheme to refurbish the baths. Big Lottery’s endorsement means there is now a fantastic future ahead for these historically-important and well loved Baths as we press ahead with the development of our wellbeing centre. 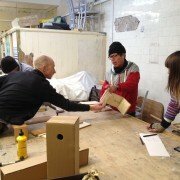 https://www.govanhillbaths.com/wp-content/uploads/2015/02/Princes-Trust.jpg 370 555 admin85 https://www.govanhillbaths.com/wp-content/uploads/2014/12/Govenhill-Baths-alt-Logo.png admin852015-02-05 19:45:352015-02-05 19:45:35Wellbeing project moves forward!